Gunshot victim Kynndal Martin, who benefited from Boston Medical Center’s Violence Intervention Advocacy Program, now works as a dietary aide. Kynndal Martin was lying on the couch, still sore from the bullet that tore through his calf a few days before, when a woman arrived. “I was skeptical about her at first,” Martin said. But he let her in. And over the next two years, his decision to open that door changed everything. The woman, Kendall Bruce, came from Boston Medical Center on a mission to treat the aspects of Martin’s injury that didn’t involve flesh or bone. She is part of a team of hospital-based advocates who work to recast the fractured lives that time and again put young people in danger. And she would lead Kynndal Martin to a surprising place. Bruce’s work is part of a national drive — decades old but recently gaining momentum — to treat violence as a contagious disease, a public health emergency. When a young man appears in the emergency room, stabbed or shot, “he already has the disease of violence,” said Dr. Gary Slutkin, founder and executive director of Cure Violence, the Chicago-based nonprofit that famously deploys street workers to defuse neighborhood conflicts. The victim’s arrival signals that more violence is likely to occur, and opens an opportunity to heal the social and emotional maladies that feed violence. As many as 45 percent of people who go to the hospital with violent injuries return within five years, shot or stabbed again, sometimes fatally. And retaliation can lead to further shootings. “It’s essential that there be the right type of professional who can continue to work with that person — to essentially change his thinking and his lifestyle so he doesn’t remain at this very, very high risk,” Slutkin said. That’s why, said Slutkin, hospital-based programs such as Boston Medical Center’s Violence Intervention Advocacy Program, now in its 11th year, are essential to any antiviolence effort. The program has recently expanded into job placement and housing assistance. Some 30 such programs operate in hospitals across the country, including at Brigham and Women’s Hospital and Massachusetts General Hospital . To plot such escapes, patients need someone like Kendall Bruce. She had been alerted to Martin’s injury the morning after it happened — he had been shot outside a Randolph nightclub — and began trying to get in touch with him. Martin blew off his first appointment with Bruce, but the advocates always keep calling. She reached him again and asked if she could come by his house. He agreed, not really expecting her to show up. That is the first objective of these encounters: identify what the client needs. A place to stay. Help getting a driver’s license or returning to school. Treatment for a mental health problem or substance abuse. The advocates also probe for each client’s talents and interests. Then, using their connections with services around the city, they map a route to a better life. As with all of the advocates, Bruce came from a similar background and has much in common with Martin. Both are young and black, each is a parent of a young child, and both endured difficult childhoods in Boston. Bruce’s parents used drugs and died when she was a teenager. Martin was thrown out of an abusive household at age 8 and then raised by his father, who provided little attention or guidance. But Bruce has found her footing in life, and serves as a tough-minded guide for Martin. It can be a tug of war. Bruce was upset when Martin rejected the apartment she found for him because it was too small. Her own first apartment was no bigger, she told him. Still, they kept in touch. “My role was to push him. Life doesn’t owe you anything,” Bruce said. “Their notion of their life trajectory is so bleak that they feel as though they have nothing to lose in this world, nobody to care about them,” said James, now the hospital’s vice president of mission. Now bigger and linked with several city agencies, the program has served nearly 5,000 victims of violence, ranging in age from 4 to 60, with half between 19 and 29. Nearly 15 percent are female, an increase from previous years. The $580,000 in annual costs are paid by foundation grants, donations from hospital employees and others, and government funding. In late 2015, the Violence Intervention Advocacy Program received a $1 million grant from the Department of Justice to expand into employment and housing, two factors identified as the greatest barriers to stability in a young person’s life. The federal grant has placed 27 clients in job training, with 15 employed, including five at Boston Medical Center. The housing initiative, which starts in the spring, will provide rent for a year as clients get help learning the basics of budgeting and banking. Then, it is hoped, clients will take over the lease. Do hospital-based violence intervention programs work? The evidence is promising but not definitive. A handful of studies suggest such programs can reduce repeat injuries and arrests for violent crime, and may save money. But these studies have weaknesses, leading to calls for better evidence. Boston Medical’s James said a study of the program’s long-term effectiveness is planned. Meanwhile, the evidence of Kynndal Martin’s life makes for a one-man endorsement. He said Bruce has been his touchstone, his motivation, his needed kick in the pants. “She’s emotional support, she’s everything — life support,” he said. Bruce connected Martin with Goodwill’s First Step Program, which paid him a stipend to attend job-preparation classes. 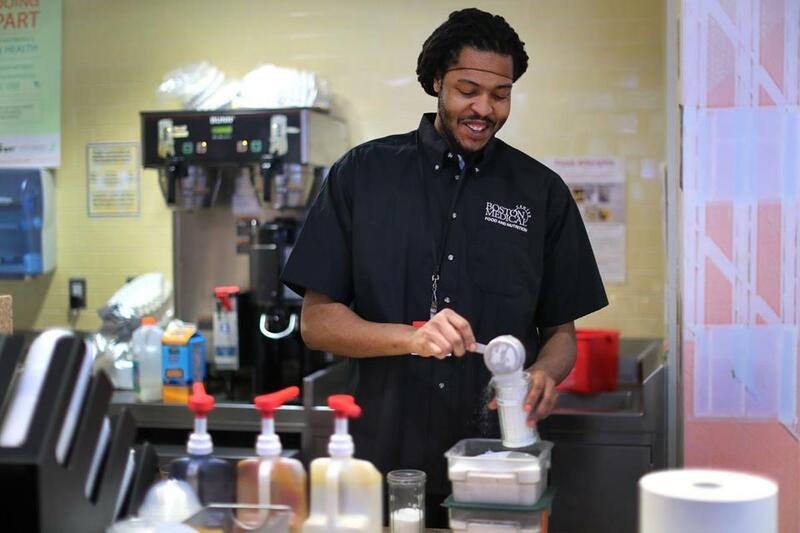 Martin, now 26, eventually got a job as a dietary aide at Boston Medical Center, and continues to work there. He now has higher ambitions: training to become a nurse. But Bruce is not done with him. “I tell people what they don’t want to hear,” she said. Martin does not want to hear that he needs to work things out with the mother of his 6-year-old son, so he can see the boy more often. “This is the next step in our work,” she said. “It’s not about you. It’s about your son. . . . I just know how it is for a young black boy to be growing up without their father.” Still, she is proud of his success at work. Martin puts it this way: “I used to chill around a bunch of hooligans.” Now just walking through the hospital corridors, he finds himself surrounded by — inspired by — “a whole bunch of important people,” including some, he often thinks, who may have just saved someone’s life.